Qingdao is famous for its waterfront, and has thousands of tourists and expats flocking here for the beaches, beer and ocean breeze every year. However, it would be a mistake to think that the fun ends on the beach in one of China’s most livable cities. 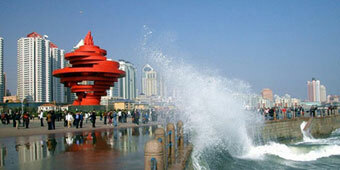 Qingdao Bay is full of other attractions that invite you to explore and experience the ocean without a bathing suit. Our first stop is one of Qingdao’s most famous icons. Regarded as a symbol for the city and used as the logo for Tsingtao Brewery, Zhanqiao Pier is a landmark that few visitors leave Qingdao without seeing. If you haven’t crossed it off your list yet, you’re definitely due. The pier is an old pagoda built in 1891, separated from the mainland by a bridge half a kilometer long. It’s a great place to get a view of the city coastline, or a spot to gaze out on the endless ocean without obstruction. The pagoda itself will be appreciated by newcomers as an authentic relic of China’s past, rare in a city dominated by skyscrapers and German heritage. Seasoned travelers of China, though, may find it a little lackluster. Despite its fame, the pagoda really is just one of China’s many, so don’t expect anything out of the norm. Getting There: Take bus 2, 8, 25, 26, 202, 217, 220, 223, 301, 304, 305, 307, 312, 316, 320, 321, 325 or 501 to Zhanqiao Stop (栈桥站). For a truly great view of the city, get out on the bay by ferry. You can charter a quick tour of the bay for as low as 50 RMB, or, for a few more RMB, explore as far as the May Fourth Square and back. It’s a great way to relax and take in the ocean air while getting in some beautiful shots of the city. For the more adventurous, there are speedboats that will careen you along the same routes at breakneck speeds and through sharp turns that will make you feel like you’re about to tumble overboard. You’ll find these nestled in a hidden corner of every stop on this list. If you have the stomach for it, take one out when the ocean is restless. Getting There: Take bus 1, 25, 26, 214, 223, 225, 228, 231, 304, 307, 311, 312, 316, 321, 367, or 501 to University Road Stop (大学路站). It’s a special crowd of people that think to make a Chinese naval museum a priority stop, but even if it seems a bit outside of your tastes, the Qingdao Naval Museum is surprisingly worthwhile. In this country where cultural relics litter every street corner, museums usually struggle for relevance. This one, though, makes its worth through virtue of disorder. You have the choice to buy a ticket to the whole centre or just the museum, but you definitely don’t want to settle. The real treat is outside. The yard is crammed with old artillery and airplanes, made fun by its lack of security. There are no pedestals or glass cages blocking these off from the public – you can get as close as you like. It’s not an uncommon sight to find a six-year old climbing up a cruise missile. The museum’s pride is docked on the bay: battleships so massive that, no matter where you are in Qingdao, there’s a good chance you can see them out your window. The museum lets you freely tour their bridges, which is an experience not be missed. Getting There: Take bus 26, 214, 223, 228, 304, 316, 321, 501 or 504 to Lu Xun Park Stop (鲁迅公园站). Lu Xun Park makes up the entranceway to Little Qingdao Isle, and it would be a mistake not to experience them both together. The park itself is a display of green trees, orange crocks and blue water working into a perfectly-tuned minimalist color palette. It’s a beautiful place to wander and take in a unique kind of garden. It also has an inescapable touch of culture – the garden was built for a revolutionary poet, and his writings are embossed in stone throughout. The path from it to Little Qingdao is a hidden highlight of the city, without a name to put on the map. It takes you along a coast of orange rock that you can climb out onto. The image of the blue waves crashing against the orange stone is an unreal sight that belongs in film and will make you feel like you’re living a romance epic. Little Qingdao itself is a small island housing a German white marble lighthouse. It has been transformed into a garden over time, and is now adorned with beautiful statues and flowers that make it one of the most gorgeous sights in the city. On the way back, finish your day by stopping at a restaurant on the path. There are shops that cater to every taste, be yours dirt cheap Chinese seafood or gourmet-priced Western cafés. You could make a whole day on this path alone, and if you made it a romantic night, it would be one to remember. No not yet, maybe not for at least half a year. The top university for Marine Studies. Stayed there for my fiery first trip in Qingdao. Served fantastic authentic Cantonese Dim Sum. Great place for imported stuff! Fantastic view for all seasons. It's like walking on a memory lane with historical architects. One of the best in China! Beautiful and serene beach. A must for visitors who want to have a scenic view of Qingdao and Huangdao.